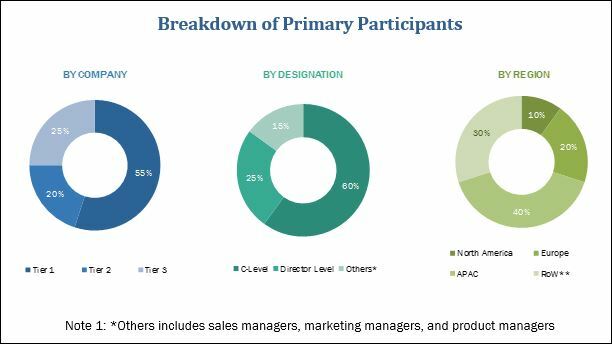 [180 Pages Report] The data governance market was valued at USD 1.10 Billion in 2017 and is expected to reach USD 3.53 Billion by 2023, at a Compound Annual Growth Rate (CAGR) of 22.0% during the forecast period. The major factors that are expected to drive the growth of the market include the rapidly increasing growth in data volumes, rising regulatory and compliance mandates, and enhancing strategic risk management and decision-making with the increasing business collaborations. The base year considered for this report is 2017 and the market forecast period is 2018–2023. The main objective of the report is to define, describe, and forecast the global data governance market on the basis of applications, business functions, components, organization size, deployment models, industry verticals, and regions. The report provides detailed information regarding the major factors influencing the growth of the market (drivers, restraints, opportunities, and industry-specific challenges). The report aims to strategically analyze the micro-markets with respect to the individual growth trends, prospects, and contributions to the total market. The report attempts to forecast the market size with respect to 5 main regions, namely, North America, Europe, Asia Pacific (APAC), Middle East and Africa (MEA), and Latin America. The report strategically profiles key players and comprehensively analyzes their core competencies. It also tracks and analyzes competitive developments, such as partnerships, collaborations, and agreements, mergers and acquisitions, new product launches and new product developments, and Research and Development (R&D) activities, in the data governance market. The data governance ecosystem comprises vendors, such as Alation (US), Ataccama (Canada), Collibra (Belgium), DATUM LLC (US), Data Advantage Group (US), Denodo Technologies (US), erwin, Inc. (US), Global Data Excellence (Switzerland), Global IDs (US), IBM Corporation (US), Infogix (US), Informatica LLC (US), Information Builders (US), IRI (Australia), Magnitude Software (US), Oracle Corporation (US), Orchestra Networks (France), Reltio (US), SAP SE (Germany), SAS Institute (US), Syncsort (US), Talend (US), TIBCO Software (US), TopQuadrant (US), and Varonis Systems (US). The other stakeholders of the data governance market include data management providers, research organizations, network and system integrators, data governance service providers, marketing analytics executives, third-party service providers, and technology providers. 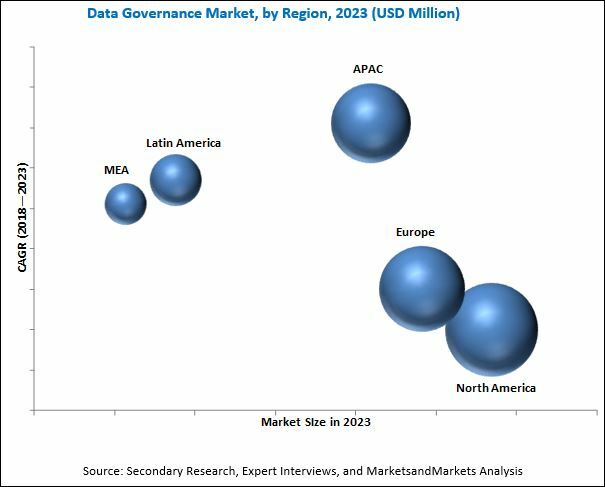 The data governance market is expected to grow from USD 1.31 Billion in 2018 to USD 3.53 Billion by 2023, at a Compound Annual Growth Rate (CAGR) of 22.0% during the forecast period. Factors such as the rapidly increasing growth in data volumes, rising regulatory and compliance mandates, and enhancing strategic risk management and decision-making with the increasing business collaborations are expected to drive the growth of the global market. The report provides detailed insights into the global data governance market that has been segmented by application, business function, component, organization size, deployment model, industry vertical, and region. Among applications, the risk management application segment would continue to dominate the market during the forecast period, as financial institutions grapple with multiple compliance reporting requirements, such as Foreign Account Tax Compliance Act (FATCA) and Firm Data Submission Framework (FDSF), which increase the importance of the risk management application in organizations. The compliance management application segment is expected to grow at the fastest rate during the forecast period. The retail and eCommerce industry vertical is expected to grow at the highest CAGR during the forecast period. Data governance solutions can be used by the retail and eCommerce industry vertical to handle large volumes of data generated across the vertical. In addition to this, high-quality, properly managed data is crucial for decision-making across organizations, therefore data governance solutions in this industry vertical help decision makers with product pricing, campaign management, sales optimization, risk management, and product management. Large enterprises are expected to dominate the market in terms of market share, as these enterprises are continuously investing in their R&D activities to improve overall performance and provide customer satisfaction. However, the Small and Medium-Sized Enterprises (SMEs) segment is expected to exhibit a higher CAGR, owing to the availability of cloud-based data governance solutions at an effective cost. In addition to this, data governance solutions providers minimize infrastructure development costs for such applications. The report covers all the major aspects of the data governance market and provides an in-depth analysis across the regions of North America, Europe, Asia Pacific (APAC), Middle East and Africa (MEA), and Latin America. North America is expected to dominate the data governance market throughout the forecast period, due to the early adoption of technologies and the presence of a large number of data governance solution providers. Asia Pacific (APAC) is estimated to grow at the highest CAGR during the forecast period. The increasing digitalization and investment in infrastructure upgrades have resulted in the higher adoption of data governance and data management solutions. The region is witnessing the increasing demand for cloud-based solutions, owing to the growing size of SMEs. Companies operating in this region provide different solutions based on organization size and their requirements. Factors such as rapid growth in data volumes, regulatory and compliance mandates, and the enhancing strategic risk management and decision-making with increasing business collaborations are expected to drive the growth of the global data governance market. Moreover, the increasing applications of Artificial Intelligence (AI) and the growing importance of effective data governance would help the key players gain a competitive edge in the overall market. The global data governance market has been fragmented and no single vendor dominates the market. Vendors have adopted different types of organic and inorganic growth strategies, such as new product launches, product upgradations, partnerships and collaborations, and acquisitions, and business expansions, to expand their offerings and enhance customer experience in the market. For instance, in June 2017, IBM announced new data governance solutions and tools, machine learning advancements, and the formation of the Open Data Governance Consortium for Apache Atlas dedicated to advancing the open framework for data governance. These new solutions and services would enable organizations to gain the deeper understanding of data and control it. They would also help them adhere to the General Data Protection Regulation (GDPR) and other strict data regulations. In June 2017, Collibra introduced the new 5.1 version of the Collibra data governance platform that facilitates enterprises to perform self-service analytics. This solution also facilitates massive shift to self-service business intelligence for enterprises. *Business Overview, Solutions Offered, Recent Developments, MnM View, SWOT Analysis Might Not Be Captured in Case of Unlisted Companies.